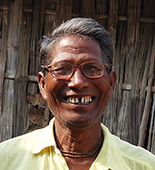 61 year old Sachindranath Sarkar is an award winning, self-taught master craftsman whose first experience with making wooden masks began when he was called upon to assist the renowned anthropologist , Dr Sabita Ranjan Sarkar of the Indian Museum, when he had come to the erstwhile West Dinajpur in his search for wooden masks. This was 1974 and Sachin was a sixteen year old student then. Gomira masks were rarely to be found in people`s homes at the time because it was believed that the mask was embodied with the spirit of the deity it represented. Such was the fear associated with these old masks, that they would be kept far away from their owners` homes, often perched on a pole in the middle of a vegetable field to divert the evil eye. It was strictly taboo for those who had not completed necessary rituals to come in contact with these masks which could endanger their very lives. Given this scenario, carpenters from within tahe community flatly refused to craft these masks and Sachin eventually found a carpenter named Bhuban Mahanto who was willing to take on the task. The masks he crafted were crude and rustic and the colours he used were very basic - lamp soot, turmeric, lime and sindoor. Intrigued by the process, Sachin decided to emulate Mahanto and try his hand at making a mask himself - one of Khar (a character in the Ramayan and a cousin of Ravan) with a suitably fierce expression. But he did this in total secrecy, afraid of being caught by his relatives and kept the mask hidden. It was only years later, in the mid eighties, encouraged by the renowned Professor Sisir Majumdar who was then teaching at Raiganj College, that he summoned the courage to participate in the district level competition for handicrafts with the mask that he had first made. This was the first time the Gomira mask had been entered in a competition and to Sachin’s amazement, he won the first position at both the district and state level competitions. It was this achievement that set him on the path to establishing himself as a mask maker of repute. Over the next couple of years, further district awards came his way, for a Shiknidhal mask and a 10 headed Ravan spanning four feet. He has not participated in fairs as extensively as the craftsmen from the Mahishbathan co-operative who are actively promoted, but specimens of his work can be found in many museums in Kolkata and across the state. 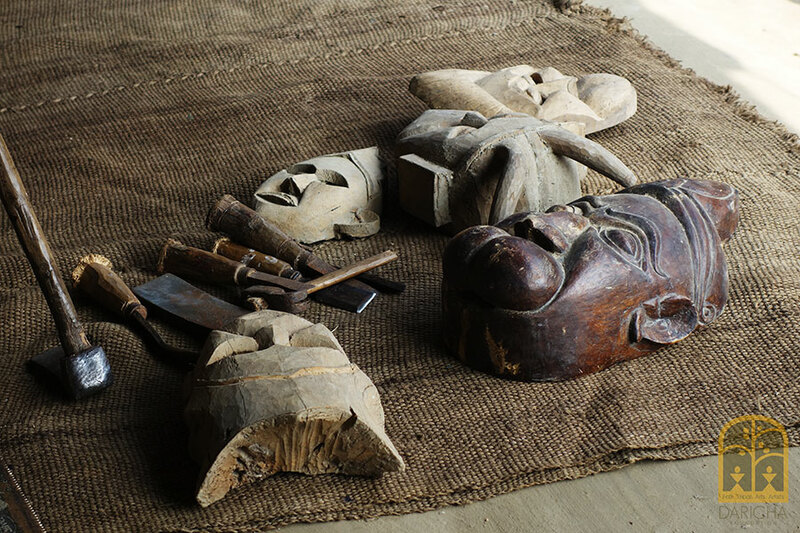 Using simple tools, comprising a set of chisels, a saw, a hammer and an adze, Sachin`s earnings today are primarily from masks crafted for urban customers outside his community though he continues to make gomira masks whenever required. He uses chhatim (alstonia scholaris) wood which is cheaper than gamar wood and nearly as light and therefore effective. He uses four basic colours, red, white, yellow and black and also combines them to achieve other colours. He applies the colour mixed with tamarind seed glue over a base coat of khori mati and finishes it with a coat of natural glue or varnish. Sometimes as per customer requests, he polishes the mask instead of painting it. 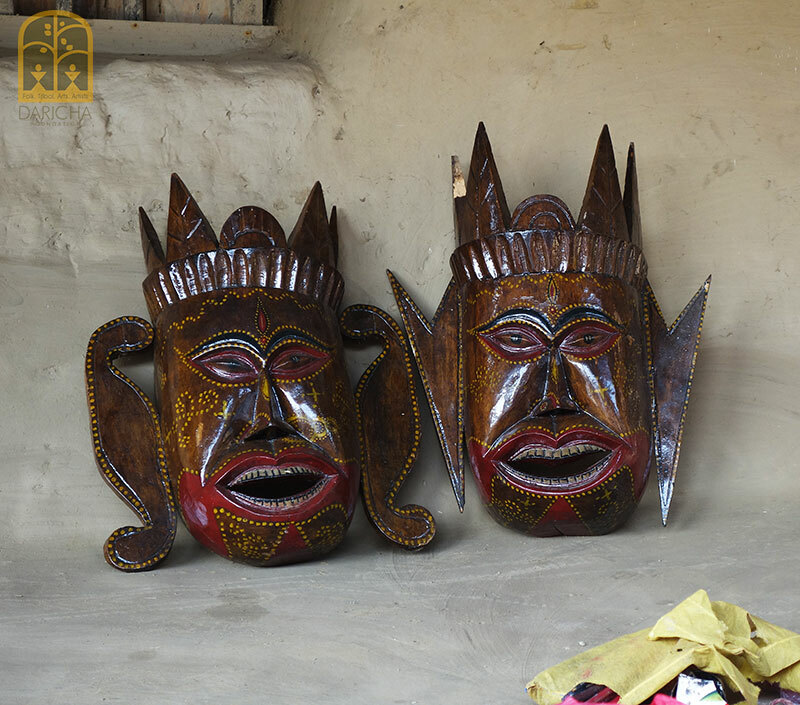 The gomira performance masks, before reuse, each year , are polished with mustard oil. Sachin also has his own Gomira group, Uttor Banga Mukhosh Dal, which is reasonably busy all year round, both for local ritual performances and for cultural programmes around the state. Sachin himself participates in the performance sometimes. He was earlier a Guru under state and central government organized training programmes and has taught many young students, both as Gomira dance and mask trainer. However, while many new dancers have emerged, no student has seriously adopted the craft. Sachin is also an agriculturist and it is the produce from his land which enables him to devote time and energy on his craft. 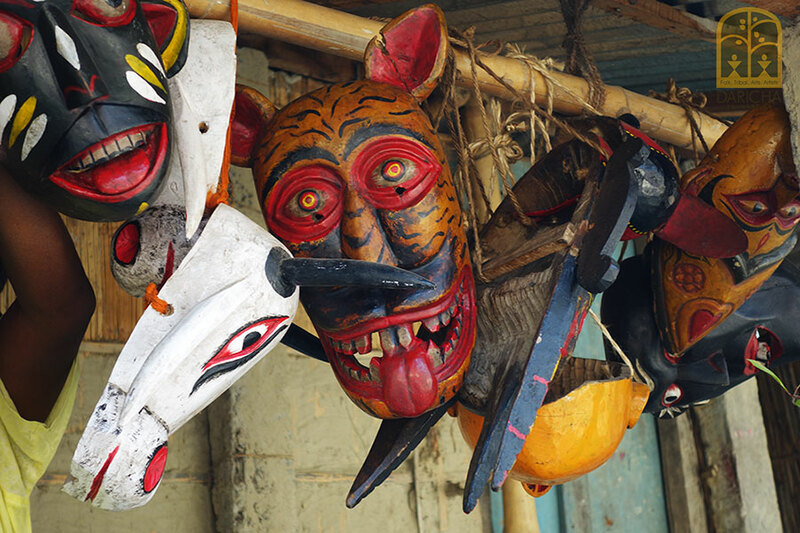 Sachin feels that the masks of Uttar Dinajpur are more traditional than those made in Dakshin Dinajpur. It has been over 30 years since Sachin has been crafting wooden masks both for Gomira and for non-ritual decorative needs, but the superstition attached to masks has not entirely gone away, Sachin feels. Nobody in his village would dare touch his masks, even today, barring the mask thieves, who have become increasingly emboldened over the years, since old wooden masks fetch very high prices abroad. Sachin, a true artist is always busy at his craft and experimenting with new ideas. He probably does not have the customer base that the craftsmen of Mahishbathan have, but whether there are orders or not, he is always deeply immersed in his craft.